Phillips Pro Systems technology, quality and reliability deliver the peace of mind you want – and need. 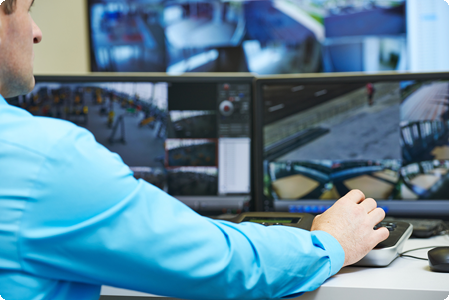 We offer end-to-end solutions for every element of video surveillance in and around your facility. Whether you’re starting new construction, renovating facilities or upgrading an existing surveillance system. Phillips Pro Systems can help you through the planning, design, installation and implementation of the system that’s right for you. Our sales partners will work with you to identify your individual needs and the specific equipment to fit them, while staying within your working budget. As the Security Industry rapidly turns to digital networks to satisfy increasing demand, Phillips Pro Systems continues to design, develop and deliver the most reliable, cost-effective security and digital imaging products, as well as full digital Security System solutions. We offer a complete line of Video Surveillance Systems with a reputation for quality and performance. and security solutions from Phillips Pro Systems. Live Online Surveillance in Action! Note: You may need to download and install the i-Pro viewer software and ActiveX update. Phillips Pro Systems full line of network devices includes everything you need for remote network monitoring via IP. Our network cameras are easy to add to your network video servers and make it simple to integrate your existing surveillance system into IP networks. In addition, our digital video recorders come with built-in IP protocol capability.Now you can check your surveillance system from your office, home, or while away on a business trip, fast and conveniently. Surveillance wherever and whenever you like, at prices that won’t compromise your budget.